Study Reveals the Cities With the Worst-Maintained Roads in the United States #infographic ~ Visualistan '+g+"
One of the sure signs of spring is driving down the road and hitting a giant pothole that had recently formed from all the snow and ice thawing. Followed by the fear of an expensive fix after hitting said pothole. Many people are more than happy to share their pothole woes, and declare that the roads in their city have to be the worst in the country, but which cities can actually claim the title for the worst-maintained roads? 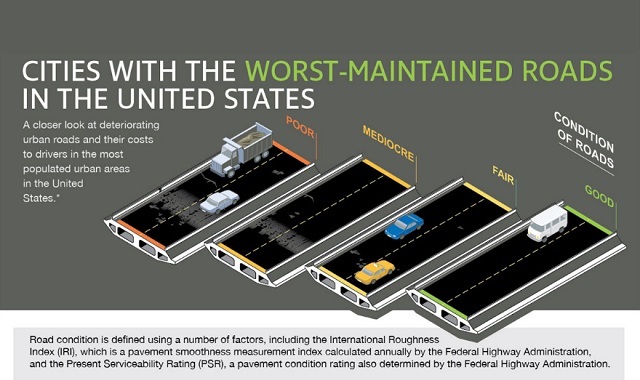 This infographic from Teletrac Navman (a GPS and truck driver software solution company which can be found at TeletracNavman.com) takes a look at road conditions across the country to find which cities have the highest percentage of roads in “poor” condition, as well as the cities with the highest percentage of roads in “good” condition. This is determined by factors such as the International Roughness Index and the Present Serviceability Rating. It even goes a step further and compares the average additional vehicle maintenance and repair costs due to road conditions for each city. How do your city’s road conditions rank?